Staging international events such as the Olympics or Commonwealth Games is an horrendous challenge for any city. Vancouver, Canada, which is only about 120 miles north of Seattle, is going through huge growing pains readying for the Winter Olympics. I'm guessing the word "hoarding" means posting, or billboard? We call the billboards hoardings in this part of the world. We are very aware Down Under of Delhi 2010. I know a few people personally who are looking very much forward to competing in India, knowing how keen people there are on sport. 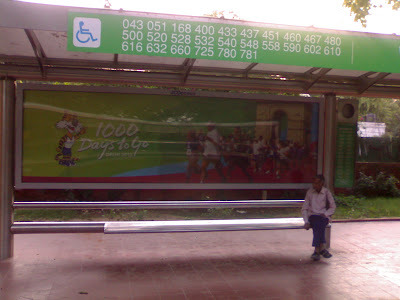 common wealth games is ok, what i look into the pic is the swanky bus stop. These have come up while i have been away. Wish to be back and experience using these!